London Mayor Boris Johnson's disgraced ex-chief political advisor whose race gaffe to The-Latest cost him his job at City Hall is back in hot water - this time in his native Australia. Spin doctor James McGrath has been accused of ordering the putting together of a "dirty file" on Labour politician who rival the right-wing Liberals for whom he is now working in a key job. A British journalist, whose interview with LNP adviser James McGrath killed off his career in London’s city hall, is “gobsmacked’’ the Queenslander found work in Australian politics. Broadcaster, writer and political activist Marc Wadsworth, editor of the-latest.com, said McGrath “poisons" politics and should be sent packing. Three years ago, Wadsworth revealed McGrath's “race gaffe", made while he worked for London Mayor Boris Johnson, who was forced to sack the top aide. In mid 2008, Wadsworth asked for feedback on Voice columnist Darcus Howe's statement that the election of Boris Johnson, a right-wing Conservative, "might just trigger off a mass exodus of older Caribbean migrants back to our homelands". McGrath retorted: "Well, let them go if they don't like it here." Wadsworth said yesterday he was not surprised by the latest incident involving Mr McGrath. McGrath, who is now campaign director for the Australia's opposition Liberal National Party(LNP), became embroiled in a fresh scandal this week when it was revealed he commissioned “dirt files" on Queensland Labor MPs and Brisbane councillors. Late yesterday, LNP president Bruce McIver dismissed suggestions Mr McGrath should be sacked and praised his campaigning skills, values and work ethic. But Wadsworth told brisbanetimes.com.au yesterday the LNP should send McGrath packing. He said he was “gobsmacked" to learn the LNP had hired Mr McGrath given his history, claiming he “poisons" the political process and brings a “bad smell" wherever he turns up. It emerged this week that Mr McGrath had commissioned former ALP staffer Robert Hough to prepare so-called dirt files on Labor politicians. Mr Hough was reportedly paid $3,075 by the LNP to provide about 50 files on Labor politicians, containing information about their private lives, strengths and weaknesses. LNP leader Campbell Newman ordered the party to destroy all the dossiers. Deputy Premier Andrew Fraser demanded Mr McGrath and LNP state director Michael O'Dwyer be sacked in response to the revelations. Newman said officials had been reprimanded but would not be sacked. Journalist Sonia Purnell, the author of the recently released biography on Johnson, Just Boris: The Irresistible Rise of a Political Celebrity, said Australian campaign manager Lynton Crosby insisted McGrath work with him on the 2008 mayoral campaign. 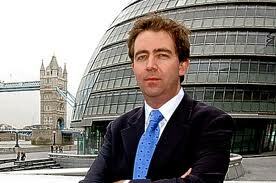 Crosby, known in England as the "Wizard of Oz", was brought in by conservative leadership to rescue Johnson's floundering london mayoral campaign in 2008. He was the Liberal Party's campaign director for John Howard's four successful election campaigns. "Crosby insisted McGrath worked with him as he was seen as a tough, bluff and gruff Australian who could instil discipline in the troops perhaps with a little bit of fear," she said. A campaign staffer told Purnell: "McGrath was very good at what matters, deciding what doesn't, and cutting through the crap. He drove things forward with his strength of will. He's quite aggressive and would bark at people, if he had to. Somehow as an australian it was easier for him to do the necessary shouting." Purnell said those who failed on the campaign were "bawled out", while the the successful were "lavishly praised and asked to take a bow". There were no allegations of dirty tricks levelled against McGrath during his time working for the British conservatives, said Purnell. Spin doctor James McGrath has been accused of ordering the putting together of a "dirty file" on Labour politicians who rival the right-wing Liberals for whom he is now working in a key job. A British journalist, whose interview with Liberal National Party (LNP) adviser James McGrath killed off his career in London’s city hall, is “gobsmacked’’ the Queenslander found work in Australian politics. Just a few months later McGrath had found his way to the paradise holiday destination of the Maldives in the Indian Ocean to work as a volunteer for the opposition Maldivian Democrat Party in the run-up to the hotly contested general election. He became the subject of an inflammatory row, after the ruling Dhivehi Rayyithunge Party published what it claimed was a confidential email from McGrath, outlining plans to turn the Muslim nation into a "multi-religious" society within the year. On top of that, the DRP has accused the MDP of employing him without a proper work visa and has called for him to be deported. Wadsworth said he was not surprised by the latest incident involving McGrath in Australia. McGrath, who is now campaign director for the country's opposition LNP, became embroiled in a fresh scandal this week when it was revealed he commissioned “dirt files" on Queensland Labour MPs and Brisbane councillors. LNP president Bruce McIver dismissed suggestions McGrath should be sacked and praised his campaigning skills, values and work ethic. But Wadsworth told brisbanetimes.com.au the LNP should send McGrath packing. It emerged this week that McGrath had commissioned former ALP staffer Robert Hough to prepare so-called dirt files on Labour politicians. Hough was reportedly paid $3,075 by the LNP to provide about 50 files on Labor politicians, containing information about their private lives, strengths and weaknesses. He was the Liberal Party's campaign director for ex-prime minister John Howard's four successful election campaigns.